Via comment by JWMJR on It’s all for Freddie………………………. EXCLUSIVE: The Fourth Estate has learned that Freddy Gray’s life-ending injuries to his spine may have possibly been the result of spinal and neck surgery that he allegedly received a week before he was arrested, not from rough excessively rough treatment or abuse from police. The Fourth Estate has contacted sources who allege that Freddy Gray received spinal and neck surgery a week before we was arrested, and was allegedly receiving a large structured settlement from Allstate Insurance. The surgery is allegedly related to a car accident in which Gray was involved.Sources allege that Gray also attempted to refinance his structured settlement into one lump sum payment through Peachtree Funding. If this is true, then it is possible that Gray’s spinal injury resulting from his encounter with the Baltimore Police was not the result of rough-handling or abuse, but rather a freak accident that occurred when Gray should have been at home resting, not selling drugs. Not that obtaining and acting on FACTS has anything to do with the destruction and blackmail of the protesters violent criminal thieves who are holding Baltimore hostage! I’m all about protest – it’s a fine American tradition. But arson, criminal damage, assault and burglary aren’t exactly a good way to convey the message you think the authorities acted inappropriately. I recently finished Grant Duwe’s book Mass Murder in the United States. The book is a decade-by-decade account of all of the mass murders occurring in America during the 20th century. It is a fine review of the topic and belongs in the library of anyone concerned with mass murderers, spree killers, and active shooters. As an account of the history of mass killing, the book has no equals. – The number of murder victims strongly correlates with how often and how long a news story is reported. While most murders in the USA have a single victim, those murders with a larger body count get a disproportionately high rate of news coverage. – The New York Times reported on 59% of the 909 mass killings that occurred in the USA during the 20th century. The number of stories devoted to each killing has been dramatically increasing. In the early part of the century, each reported killing averaged 1.67 stories. In the period from 1965-1999, each reported killing garnered an average of 6.36 stories per killing. Coverage of mass murders is now 3x that of what was seen in the country before 1965. – Murders where the killer knew his victims and murders during the commission of another felony crime make up the bulk of murders in the United States. The New York Times was less likely to report these incidents than murders that occurred in more “exciting” circumstances. – “Assault weapon” use dramatically increased the chances that a particular story about mass murder would be picked up by news wires and distributed nationally even though those weapons constitute a very small percentage of murder weapon overall. There are far more details in the book, but the bottom line is that the news media seriously distorts the reporting of mass murders. If you were only to look at reported mass murders in the media, you would think that all of them were committed with firearms, in public places, by white offenders who were strangers to their victims. That is a very inaccurate representation of reality. Of course, you should visit the link, and read the whole thing. Or the book – if you can stomach it. My real mother (who passed when I was in the second grade) had lots of 78 RPM records of classical music – including The Nutcracker Suite done straight by Spike Jones! I still have some of them. My dad was a big band kinda guy. And 50’s crooners. Perry Como, etc. I had never heard it. I was too busy listening to Johann Sebastian Bach. My leg disability developed between Eighth Grade and High School. No P.E. for Guffaw. The high school principal ask me if I could play an instrument. I could not. He said, “Well it’s Choir for you!”, as if it were some kind of punishment. It was after I graduated and went on to college that I developed a liking for popular music. 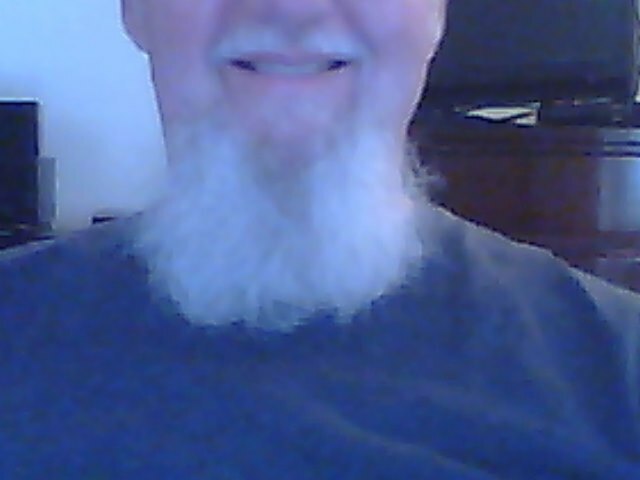 The Beatles, The Eagles, Credence Clearwater Revival, Linda Ronstadt, Fleetwood Mac, Emerson, Lake and Palmer and many others. Jethro Tull. I even taught myself a bit of flute to play along! But Bach will always be my first musical love. As some of you know, my roommate is a renowned hairdresser. As such, she is an artiste’, or at least artistic. She is also (by her own admission) an old hippie was a hippie in her youth. As such, she tends to lean toward pushing the envelope stylistically. And she recently decided to tweak it! Kinds of ‘biker meets old man’! I believe contracts between people (and corporations) should be voluntary in nature. If your religion (or principles, or personal beliefs, or bigotry) coerce/convince you to not do business with someone because of their beliefs, or creed, or disability, or gender, or age, or sexual preference, et al, then, by all means, DON’T DO BUSINESS WITH THEM! Be prepared to reap the attention of the Federal government. Federal law already prohibits denial of goods or services due to a customer’s race, color, age, disability, or gender. (Thank you President CLINTON!) Why do States feel the need to rubber-stamp the federal law? HOWEVER, I also believe, as they do in Texas, that businesses have to right to refuse service. Period. No explanation is necessary or required. And THE MARKETPLACE will make the ultimate decision! If a business excludes certain persons from engaging in contracts with them, then they will make less money. More open businesses will prosper more. Because there are more capitalists then there are bigots. I’m certain there are more businesses ready, willing and able to do business with any customers brought to them by anyone with a wallet. In Indiana, Arkansas, and Texas! Imagine a world where government stays out of such things? Why would I want to do business with someone who wishes to not do business with me? Just to force my agenda on THEM? 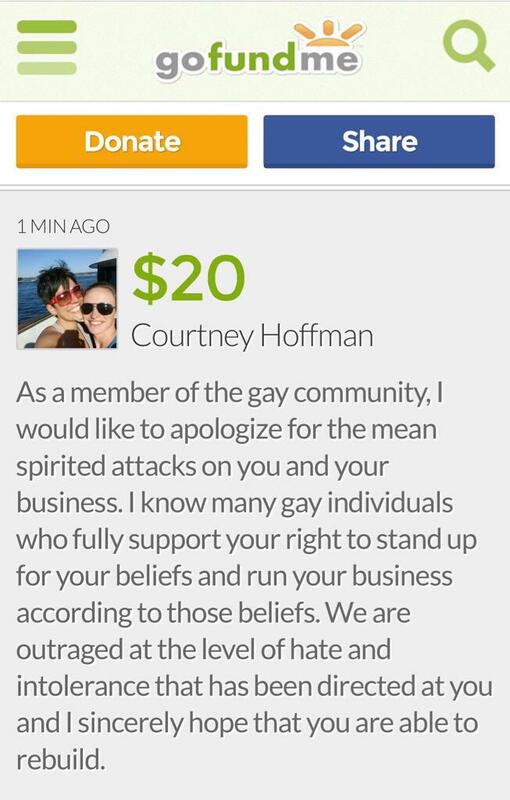 A pizza place in Indiana closed because of protests by persons who didn’t like their refusal to cater a gay wedding. Here’s a hint – go elsewhere! POLITICAL CORRECTNESS IS KILLING US! correction – the COW wash! 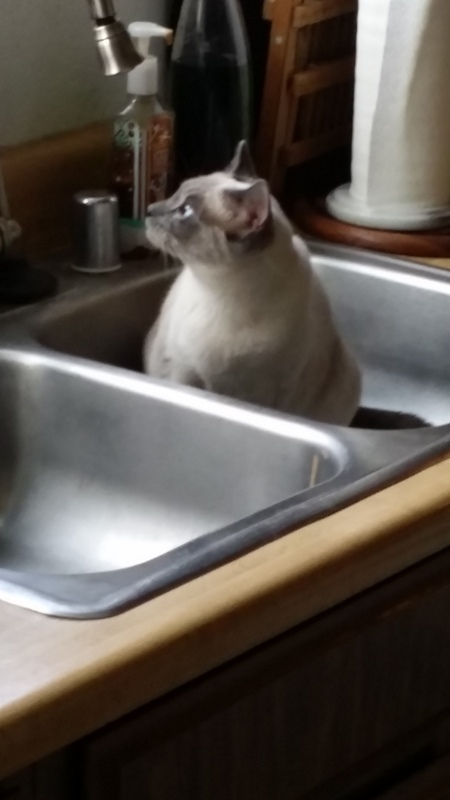 SO…I come downstairs having concluded a short nap the other day, and I hear the water running. NOT in the washer; NOT the downstairs bathroom toilet refilling. And I knew no one else was downstairs. This warranted immediate further investigation. 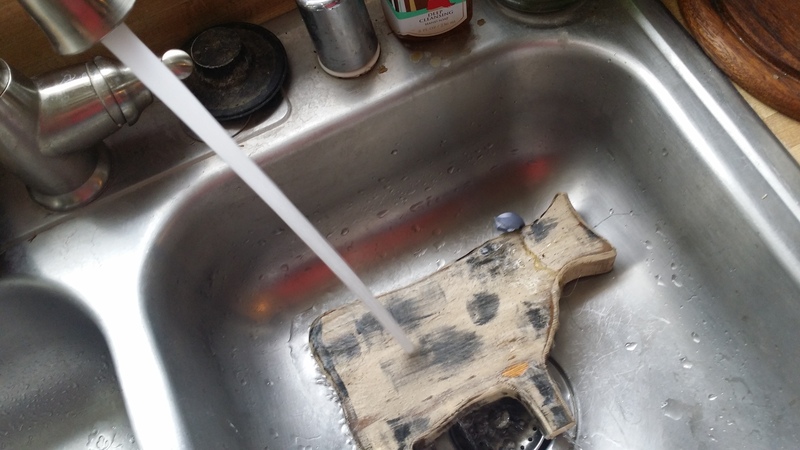 A wooden tcotchke of my roommates, in the likeness of a cow, being washed in the kitchen sink! Further forensic investigation determined the kitten (who has recently discovered she can occupy the kitchen counter in our absence) had tried to climb up into the window sill, and knocked down the folk-art cow into the sink. Then, being frightened by her action, she rushed to escape, turning on the faucet in so doing. No permanent harm done, to the art or the kitten. She’s not like the BAC (big-a**-cat) who is conspiring with the puppy to kill me! Oh, Those Nasty Oil Corporations! You’d think that helping college students get an education sponsored by government would be a non-profit endeavor, wouldn’t you? Government – finding ways to empty your wallet since the Whiskey Rebellion! My beloved ’89 Isuzu Trooper (Molly’s Trolley) gave up the ghost in 2002. I traded in her carcass for the only ‘decent’ car I could then qualify for. A 2000 Oldsmobile Intrigue. Which I still own and sometimes drive. In 2015. Because my being on disability means I just squeak by, and cannot afford car payments. My last significant repair cost over $700, which I borrowed from my roommate and paid back @ $100/month. Plus my rent. Ouch. I’ve oft had fantasies of getting some extra funds. Paying off long-overdue bills and maybe getting a slightly newer car. And, considering the questionably available maintenance and longevity of the Olds, she still runs. Sometimes. So, why not a GM car? In comments filed with a federal agency that will determine whether tinkering with a car constitutes a copyright violation, OEMs and their main lobbying organization say cars have become too complex and dangerous for consumers and third parties to handle. Good thing Dave-the-genius-mechanic is moving out-of-state! Wouldn’t want him to get in trouble for tinkering with my car. After all, he just repairs Airbus A320s for U.S. Air American Airlines! Guess I will now always need a G(overnment) Motors – approved shop! And the sad part (aside from Dave leaving the State! :-( ) is of all the beater cars I’ve owned, THIS is the one who lasted the longest! To which a lecture hall of 300 or so randy college students cheered. We have been watching the decline and fall of (Great) Britain for some time. Political correctness, coupled with inclusion of foreign cultures (and not promoting assimilation) are the proximate causes. Destroying the economy, devaluing the established culture, and passing more and more ridiculous legislation with which to strangle the people are the order of the day. Just like here in the States. (…) Great Britain’s Judeo-Christian heritage and moral values have been gradually eroded away after years of invasive ‘progressivism’ to the point where every degenerate from Pakistan to Perth feels comfortable enough to push their sexual agenda and indulge in once taboo sexual practices without shame. ‘Progressivism’ spreads like weeds in a flower bed; if they aren’t regularly dug up by the roots and destroyed they will flourish and eventually take over, choking off any flowers that try to bloom. You should visit the link above and read Daniel Thomas’ entire report. Bring with you an airsick bag. And, I suspect, as it is with most things Anglotrash, this concept will be exported to the Colonies. Because, after all, we are so backwards here. He’s never had to use it. Rees keeps a small Smith & Wesson 9 mm pistol and a large Mossberg 88 shotgun in his off-campus apartment in Chapel Hill. On Tuesday afternoon, before bringing his firearms outside, Rees went into a back room and — with a click that accompanies guns being cocked — removed the ammunition from the guns’ chambers. Sensible people with concealed carry permits should be able to take their guns on campus, he said. A North Carolina law passed in 2013 allowing concealed carry permit owners to bring guns on public college campuses — as long as they were stored in closed compartments in locked cars. Nationwide, there has been a push to allow guns more liberally on campuses. And now there’s a new argument; they’ll help curb sexual violence. The plan was to send my daughter off to college with all the tools necessary to survive and flourish. Including the ability to balance a checkbook, cook, and use a defensive firearm. Unfortunately, I never got the chance to implement it. The mindset of the promoters of ubiquitous defenseless persons continues to amaze me. I truly don’t know what else to say.